Now, the MSCWB Junior Assistant Admit Card 2019 is Out..!!. The Municipal Service Commission, West Bengal released the MSCWB Junior Assistant Hall Ticket 2019. The MSCWB Junior Assistant Exam is scheduled on 17th, 24th February 2019. So, the candidates can refer to this article for the details and download link which is provided at the bottom of the page. Moreover, the candidates should regularly check the Official website for the latest details. The selected candidates will be promoted for Personal Interview. After that, the candidate will be placed in the Junior Assistant post in Kolkata, West Bengal. Moreover, the table below gives you the MSCWB Junior Assistant Exam Date and Junior Assistant Selection Process which are useful for the Applicants. This information gives you a clear idea on the MSCWB Junior Assistant Exam Date and from where to download the Admit card. The Official Links are also given to the bottom of this page. Hence, the table gives you brief information about the Admit Card, MSCWB Junior Assistant Exam Date, and Job Location. From the below sections, you can get the details Junior Assistant Selection Process. The Kolkata Municipal Service Commission is recruiting for 200 Junior Assistant posts on behalf of the Municipal Service Commission, West Bengal (MSCWB). This Commission every year conducts the Selection procedure in two rounds. As known, there are 2 rounds, one is a Written Test followed by a Personal Interview. Candidates will get the clear idea after referring to this post. Scroll down for further more details. Carrying an Identity Proof for the Examination Hall is very important. As well as, taking it for the exam helps you very well in the verification purpose. Officials of the MSCWB are not allowing the candidates without the identity proof to the exam. Along with the Hall Ticket, carrying ID is also an important thing to keep in mind. The candidates are requested to take any one of the given lists below for the Junior Assistant Exam 2019. As soon after downloading the Hall Ticket, the candidates should go through the Admit card and check whether the information of yours is correct or not in the Hall Ticket. If any mismatch, notify it to the officials. 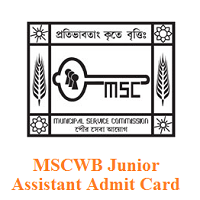 The most important task for the candidates who are about to appear for the MSCWB Junior Assistant Exam is to download the valid MSCWB Junior Assistant Admit Card. Aspirants who are confused about downloading the hall ticket can refer to this section. In this section, we have provided the stepwise procedure to download the admit card. Then, the home page of the official site displays on the screen. Now, search for the Admit card link in order to get the Hall Ticket and know the MSCWB Junior Assistant Exam Date. Click on the link and fill the required fields asked for. Recheck the details once again before submitting them. Make a click on submit button. Finally, you will get the MSCWB Junior Assistant Hall Ticket 2019. Download the admit card and take copies of it for further professional purpose. Hence, got all the details about the MSCWB Junior Assistant Hall Ticket and Junior Assistant Selection Process. For more details, please bookmark the Freshers Now and ask us for ay doubts through the comment section provided below.